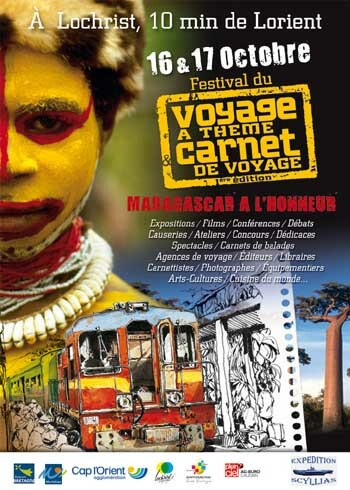 On 16 and 17 october was organized, in Inzinzac-Lochrist, the first edition of the Theme travelling and Trip book Festival. About seventy exhibitors came, among them genuine explorers and great travellers. L'Expédition Scyllias was also present in its stand to speak and share about underwater adventure and contemporary archaeology. One could take advantage of this opportunity to meet and exchange with the dynamic team, chat with other passionate divers and particularly wreckdivers. On saturday, in the musée des Forges, the team gave a lecture on the immersed heritage off Lorient shores for an attentive converted public. A few of these magnificent wrecks was evokated to underline the unknown treasures laying at a short distance of Lorient harbour and île de Groix. The Festival was also a good opportunity to sign the differents books (presented in our stand) published by the association or its members, establish connections with professional, meet the public and promote next actions and projects. 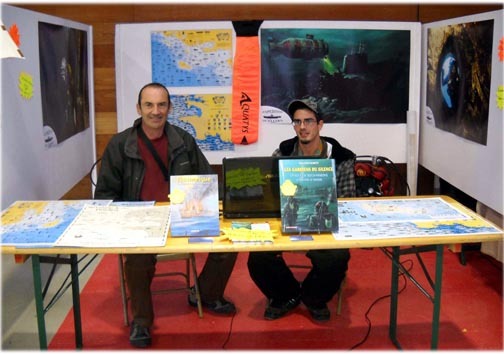 L'Expédition Scyllias' stand, conducted by Jean-Louis and Florian Maurette, was a warm site were passionate divers could exchange about contemporary wrecks and underwater trips around the world. It was adorned by the magnificent paints of our friend Andreï Loubianov and by charts of GRAHMBS.